The average high temperature on the Treasure Coast reaches 90 degrees in June and stays there through September. In past decades, this meant people would not live in Florida. However, with the advent of home air conditioners in 1958, demand to live in Florida skyrocketed. In 1950, the population was 2.7 million. By 1970 it reached 6.8 million; a jump of 250%. Window and central air conditioning system operate in exactly the same way with very similar components. Smaller, less efficient components are used in window units, to make them cheaper, lighter, and able to run on standard electricity. Both window and central air conditioners have their components separated into two halves. For a central, “split system”, the outside half is located on a concrete pad beside your house and contains the condensing coil. 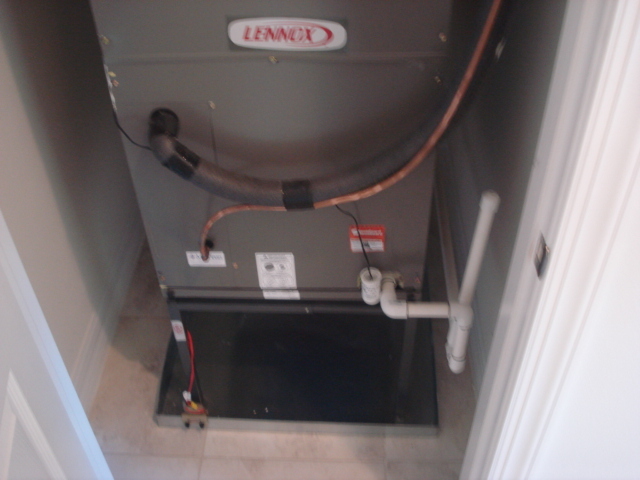 The inside half, usually in a metal housing located in a closet or possibly in your garage, contains the evaporator coil. For a window unit, the condensing and evaporative halves are separated internally within the window housing. Each “coil” is a long piece of tubing coiled up which carries a refrigerant. A widespread misconception about air conditioners, either window units or central house systems, is that the system brings outside air into your home. It does not. With either a window unit or a central system, only your home’s indoor air is blown and circulated. Inside any air conditioning system, a unique compound, called a refrigerant, is pushed and sucked, back and forth, in a highly controlled manner, between the condensing coil outside, and the evaporator coil inside. At different points in the system, the refrigerant may be a gas, or a liquid. Think of the refrigerant as a conveyor belt that continuously carries heat out of your house. As the refrigerant travels through the evaporator coil inside your house it changes (evaporates) from a liquid to a very cold gas. As the refrigerant gas travels through the evaporator coil inside your house, it absorbs heat from the warm air in your house, which is blown by a circulation fan across the surface of the evaporator coil containing the cold refrigerant gas. Your house air is thereby cooled, then blown back into the house. Next, the now warmer refrigerant gas is sucked to the outside condensing coil through a suction line. As it moves through the condensing coil, it unloads all the heat it captured inside the house into the atmosphere. As the heat is unloaded, the refrigerant gas is compressed, cooled with outside air, and condensed back into a liquid, ready to again return into your house to pick up and remove more heat. There are two types of refrigerants; the traditional one is R-22 (Refrigerant 22) and is referred to as Freon. By law, it will be eliminated from use in new equipment by 2010, and completely eliminated from any use by 2020 because it destroys ozone. The second and newer refrigerant available is call 410A. It is the industry’s agreed upon replacement for Freon. However, the two refrigerants are NOT interchangeable, and neither is their equipment. Have your air filter changed (monthly) to prevent particulate from accumulating in the evaporator coil, which reduces air flow and efficiency, and which traps moisture that leads to corrosion and mold growth. Have the refrigerant checked to ensure the proper amount is present. If you need a new system, certainly consider cost, but give weight to: efficiency ratings; (13 SEER is the minimum) which will effect your electricity costs, your choice of refrigerants; that will be restricted in the future, warranty periods; for parts and labor, and get at least two bids from licensed HVAC contractors.